On February 10, DH and I enjoyed another "Italian Night" up at the motel. This was the third year they have put this event on and it was another hit. For $29 a person, we got to eat spaghetti and meatballs (NOT homemade - but not bad), a salad and breadsticks (again, not homemade - but tolerable). After supper they had a comedian to entertain all 130 of us. He really was very good. His name is Alex Jackson from Minneapolis, and I encourage each and every one of you to catch his show if you possibly can. This small amount of money also allowed us to sample (and buy) wines from a little winery up in Estherville, Iowa. 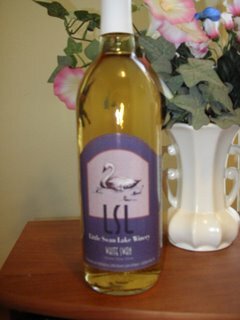 Little Swan Lake Winery is a relatively new winery in that their grapes are not mature enough to actually bottle, so they buy the juice from other wineries and mix them on site. Hence the strange names. I only sampled the Buffalo Blush and White Swan. Both are actually semi-sweet, but since I lean toward white wines, I bought the White Swan. Two bottles, actually. One to drink during dinner and entertainment, and one to bring home to share here. I've even tried my hand at photographing it. I apologize for the blurry picture - I'm really new to this! Now, I'm no wine connoisseur, I just know what I like. This was sweet without being too sweet. Very mellow, actually. Fragrant, with a beautiful amber color. An all-around versatile table wine. I'm very happy that Scott and Diane Benjamin have decided to bring wines back to Northern Iowa. And that the motel has taken the time and trouble to bring a bit of culture to this little town for the last three years. May we have many more nights of food, fun and wine!